This calculator will translate your annual salary into its hourly, daily, weekly and monthly equivalents. Enter your annual salary using only numeric digits 0-9 and, if needed, a decimal point. Enter the average number of hours you work each workday. Enter the average number of days you work per week. Enter the number of hours you would get paid overtime for each week if you were paid on an hourly basis instead of on a salary basis. The calculator will search for an hourly rate that would roughly add up to the entered annual salary when an overtime rate of 1.5 times the hourly rate is factored in. This your hourly pay based on your annual salary, the number of hours you work per day, and the number of days you work per week. If you entered a number of unpaid overtime hours per week, this would be your hourly rate if you were paid on an hourly basis -- with time and a half for overtime -- instead of on a salary basis. If you did not enter a number of unpaid overtime hours per week, the result will be N/A (Not Applicable). This your daily pay based on your annual salary, the number of hours you work per day, and the number of days you work per week. This your weekly pay based on your annual salary, the number of hours you work per day, and the number of days you work per week. This your monthly pay based on your annual salary, the number of hours you work per day, and the number of days you work per week. This online Annual Salary to Hourly Pay Calculator will translate your annual salary into its hourly, daily, weekly and monthly equivalents. Plus, if you're being paid on a salary basis, but you are working more than 40 hours per week, the calculator will even calculate what your hourly rate would be if you were getting paid on an hourly basis and getting time-and-a-half for overtime. If you are paid by the hour and want to know how much you are making on an annual basis, visit the Annual Salary Calculator. 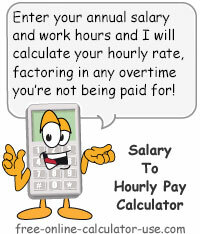 Or, if you would like to know the net profit you are earning from each hour you allocate to work, be sure to check out the Real Hourly Wage Calculator (WARNING: May cause lower jaw to come in contact with belly button). Enter the number of days you work per work week. If you are paid on a salary basis, but work more than 40 hours a week (or more than 8 hours per day, etc. ), enter the number of overtime hours you would be getting paid for each week if you were paid on an hourly basis. Click the "Calculate Hourly Pay" button.